Kidney transplantation is a very big area with lots to learn about. We have published a booklet ‘Kidney Transplantation - A Guide for Patients’ that tells you all you need to know about receiving a kidney transplant. Your nurse will give you a copy of this on request. A kidney transplant is undoubtedly the best long-term treatment for patients who have developed irreversible kidney disease. While this sounds very daunting at first, the procedure is performed, fairly frequently, with excellent longterm results. However a kidney transplant is not for everyone. Very elderly patients, or those with significant problems such as heart or lung disease, might not be medically suitable to undergo transplantation. Your team will discuss the best options for you. To receive a kidney transplant you must be in reasonable general health apart from kidney disease. To determine your health, you will need to undergo a complete medical evaluation. This will be undertaken by your own kidney team and will include an extensive list of blood tests, including tissue typing bloods, hepatitis B test, HIV test and many others. There will also be a test of your kidneys and cardiac function. It is possible to begin the process of going on the kidney transplant list, before your kidneys have failed completely, although your kidney function does need to be less than 20%. Once these tests are completed, your kidney team will refer you to Beaumont Hospital where you will be asked to come and meet the Beaumont transplant team. At this visit, the pros and cons of a kidney transplant will be discussed. You will be given the opportunity to discuss any issues you have at this point. If all your test results are acceptable, you will be placed on the kidney transplant waiting pool. It is very important that, while you are on the transplant waiting pool, you remain contactable. A suitable kidney may become available at any time of the day or night. You must let the transplant co-ordinators know if you are away or change your contact details. While you are on the transplant waiting pool, you must send blood samples to the transplant laboratory, at Beaumont, at least every 3 months. If you are on dialysis, this will probably be done automatically for you but, if you are not yet on dialysis, you will be sent a letter to organise an appointment for you to have your bloods taken. It is your responsibility to ensure that these samples are taken, by your doctor/nurse, and sent to the hospital every month. If these blood samples are not kept up-to-date, your name will be suspended from the transplant waiting pool. When you receive a call, regarding the possibility of a suitable transplant, it is of vital importance to travel to Beaumont Hospital as quickly as possible. You will be asked to fast from that point. You will go to St. Damiens Ward on the 4th floor. In St. Damiens you will again undergo many different blood tests, x-rays and heart monitor, etc. You will also be seen by the surgeon and anaesthetist. Only after all these evaluations are available will the final decision be made to go ahead with the transplant. In some situations, the cross-match test will come back positive, which means that this kidney is not suitable for you. This can be extremely difficult and disappointing for you and your family. The kidney team will be there to support you, through this time, in the hope that a better match for you appears next time. If the kidney is making lots of urine and the serum creatinine is falling, it implies that the kidney is functioning well. About 10% of patients will experience a rejection episode, where the body attacks the transplanted kidney, resulting in a rise in creatinine. If this happens, you will probably need to have a transplant biopsy and then undergo a ‘boost’ of high dose intravenous steroids for 5 days. The good news is that the vast majority of rejection episodes respond to this treatment. At present, in Ireland, this is the commonest form of kidney transplant. A person who has had an irreversible brain injury, usually from an accident or brain haemorrhage, becomes a kidney donor. In Ireland this is only done, with the consent of the patient’s relatives. The brain stem is responsible for the capacity for consciousness. If brain stem is irreversibly damaged, this constitutes brain stem death, which constitutes death of the person. The donor is taken to theatre, where their kidneys and frequently many other organs are removed for transplant purposes. The problem with this approach is that there are far more patients in need of a kidney transplant than there are kidneys for transplant available. The average waiting time for a kidney transplant is two, to two and a half years, although there can be enormous variation, with some patients waiting less than 6 months and some patients waiting more than 5 years because of the difficulty of matching the new kidney to particular needs. To access the transplant list, fairly strict rules are in place. 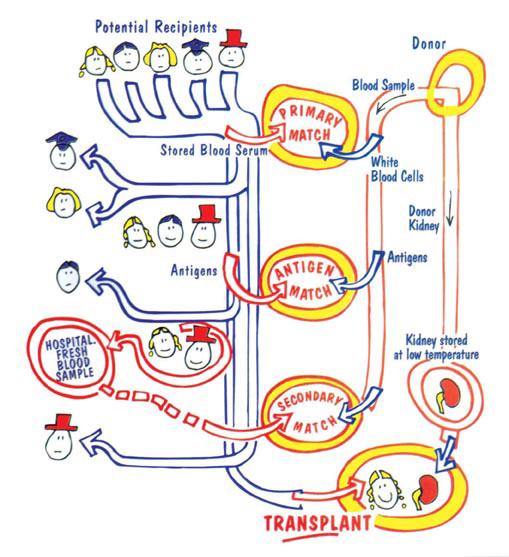 Priority is given to patients with a perfect match between the donor and recipient. 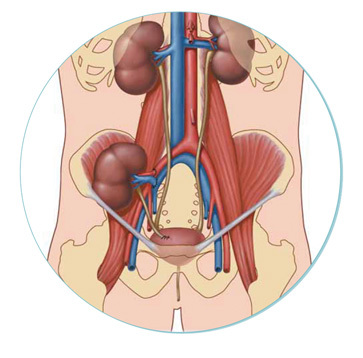 After that, the major criterion used to allocate kidneys is the length of time patients have been waiting. Children are also prioritised, and patients with very difficult life-threatening clinical situations occasionally are considered as priority. On average, the one year success rate of a kidney transplant is 92% and, on average, a cadaveric kidney lasts 14 years. For patients with Type 1 Diabetes it is also possible to receive a combined kidney/ pancreas transplant. You should discuss, with your kidney team, if you think you might be suitable for this. This is the best solution for the long-term treatment of kidney disease. It provides the best long-term results, in terms of patient and graft survival, and commonly means the patient does not need an extended period of dialysis. The disadvantage is that a live healthy person needs to undergo a very significant operation to have one of their kidneys removed. This procedure carries risks to the donor. These risks can also include the occasional risk of the donor dying in the process. This is extraordinarily rare but does happen about one time in three thousand. There are a few essential rules that the donor must fulfil before being considered a potential live related donor. The final cross match test must be negative. The potential living donor will have to volunteer themselves and make contact themselves with the Transplant Office phone: 01-8528397. The donor will undergo a very extensive medical and psychological evaluation to determine that they are suitable. This will include a number of special investigations and examinations by an independent doctor. The one-year success rate of a living donor is about 95% and, on average, a living donor kidney will last 16 years. However, if your donor is a ‘perfect match’, on average such a kidney will last 28 years. 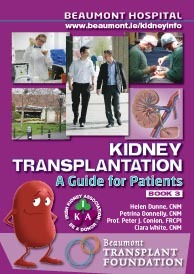 A booklet called ‘Live Donor Transplantation’ is available from the Transplant Office. Following the transplant, you will need to remain on transplant medicines for the rest of your life. The actual dose, that you take, will change from time to time, particularly in the early months. After the transplant, they will be rapidly reduced. If you ever stop taking the transplant medicines, you will lose your transplant kidney through rejection. 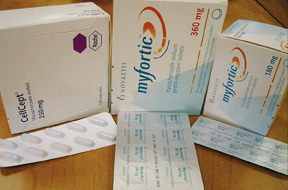 There are many transplant medicines, such as Prednisilone, Prograf (Tacrolimus) and CellCept (Mycophenolate Mofetil). These medications, while effective, cause a number of side effects. Steroids can make you gain weight, become puffy around the face, increase your blood pressure, and sometimes increase the risk of diabetes. Prograf is a powerful immuno-suppressant. It can, however, make you more susceptible to infections. Other side-effects include skin cancer, and other cancers, and, in the long-term, kidney damage. Your doctor will try to achieve a balance between using the lowest possible dose to avoid rejection, and to minimise the risk of kidney damage and other side effects. CellCept is also a powerful immuno-suppressant. 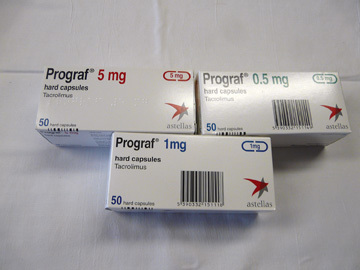 It has many of the side effects of Prograf, but it does not damage the kidney. It can cause diarrhoea and stomach upset initially. A kidney transplant does not last forever. On average, it lasts 14 to 16 years. If the transplant fails your doctors will aim to put you back on the transplant list for another kidney transplant. The transplant operation is a significant undertaking and the risk of dying from the procedure is about 3%. Infection is an important problem after transplantation. In the first 6 months, you are at risk of developing a viral infection called CMV. If your doctor determines, by a blood test, that you are at risk of CMV, he will prescribe a 3 month course of Valgancyclovoir, which is very effective at preventing it. You will also be prescribed a 3 month course of Septrin to prevent you developing a lung infection call Pneumocystis (PCP). Even after the first 3 months there is an increased risk of bacterial infections of the skin, lungs and urine. Cardiovascular Disease. After a kidney transplant, you are at a higher risk than the general population of developing heart disease. Your kidney team will, therefore, take great care to ensure that your blood pressure and cholesterol are kept in the normal range. This may frequently require you to take medications. Cancer. After a kidney transplant, the risk of most forms of cancer is increased compared to the general population. There are two particular forms of cancer which cause particular concern - skin cancer and lymphoma (a form of cancer of the lymph glands). Skin cancer will develop in up to 25% of kidney transplant recipients, mostly in sun-exposed skin of the hands and face. This is usually easily treated with local excision or by freezing it. This form of cancer can be dramatically reduced by avoiding sun exposure and wearing high factor sun block. The other form of cancer we worry about is lymphoma, which occurs in about 1 in 200 transplant patients (0.5%). This is a serious problem that requires reduction or elimination of immunosuppressant drugs and might also require chemotherapy and radiotherapy.